1&1 domains are currently the cheapest, cheaper than even Godaddy to register. However, maintaining and renewing a domain name with 1and1.com is expensive. In this review, I take you through 1and1.com domains. I have been their customer for 6 months now, registered two domains (including this). So, here is my honest review about them which will help you make a decision on whether or not you should register a domain with them. The world is slowly shifting from classic domains like .com. 1&1 is not different, they allow you to register your domain with any latest domain extensions like .xyz and more. 1&1 domains include 1 email account with 2GB mailbox space and unlimited email forwarding, unlimited subdomains and whois privacy to secure your information. The initial domain registration period with 1&1 is 1 year, no more no less. This means you only enjoy the huge discount only and only for 1 year. Unlike other registrars, who allow you to take advantage of the current discount and register for an extended number of years. 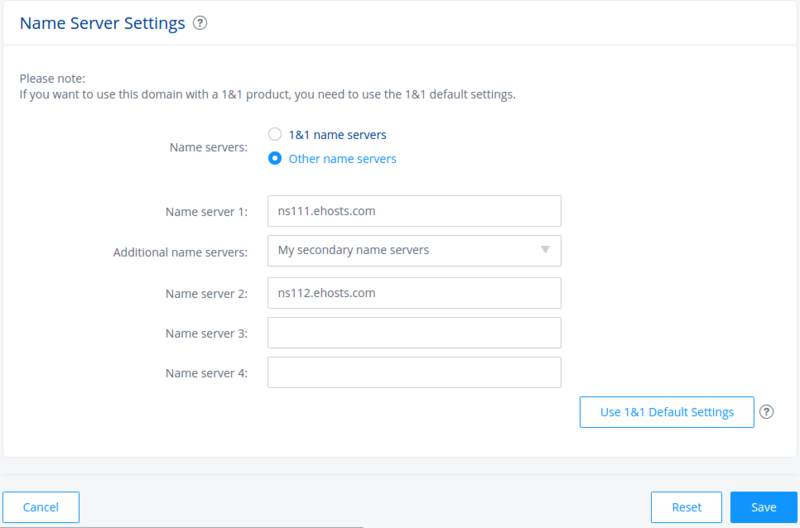 As you can see from a screenshot above, 1&1 makes managing your domain quick and simple. You can set switch your domain to auto renew or you can turn off auto renew so you will have to renew your account manually when the hosting period expires. The Domain Manager interface is simple and easy to navigate, which makes it easy to edit domain destination and contacts. This manager helps you manage and edit DNS settings, transfer/cancel your domain and other additional features. Setting up your name servers at 1&1 is simple, just click “Other name servers” radio button, punch in your Name server 1, if you use a secondary name server, you have to select “My secondary name servers” option from Additional name servers then, you will be allowed to add Name server 2, 3 and 4. When you hit Save, it can take upto 48 hours for the changes to take place and domain to propagate on your new server. To me, this has always taken less than 30 minutes before my domain propagates to a server I am pointing it to. As you can see from a price chart above, you can register a .com domain at $0 for the first year. This does not mean you don’t pay anything though, as there is ICANN year fee of $0.18/yr. To register one, click here to get started. .com, .org, .info and .net all renew at $14.99 on your next year, you are billed this a mount after the first year expires (this is if the prices were to stay this way for the next 12 months). Otherwise, you are billed on the then prices. 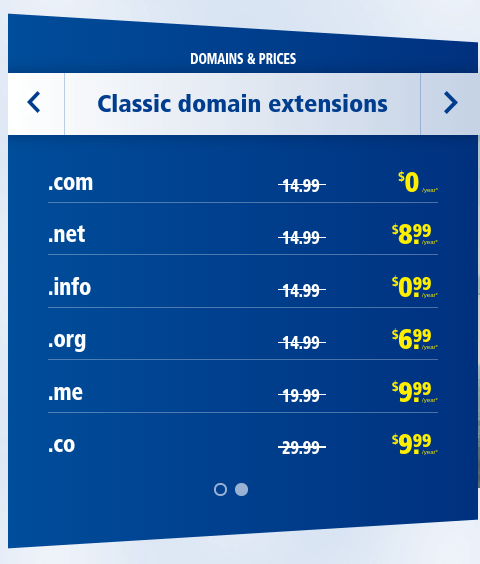 Aside from classic extensions, 1&1 also has new domain extensions too like .wedding which costs $19.99 for the first year then $39.99 after first year has expired. 1&1 provides two ways you can get help and support, via searching their knowledgebase which has got written information to help you with some of obvious issues like setting up you account, setting up DNS and the like. However, if you want to get help in real-time, then the only option you have is to place a phone call. This way you will be able to talk to support team in different departments, from sales, billing to technical support. I find 1&1 support still lacking. In my opinion, a chat support works better than all the above, unless the issue really requires placing a call, I find spending a lot of credit on international calls (for my case) a lot more expensive. There is no business that is completely good or bad, you simply have to look at both the good and bad side, and if you can be able to withstand the bad side when you like the good side, then you are good to go. So, 1&1 is not different, I’ll point out both the benefits and drawbacks of registering a domain with them and its upto you to decide whether or not you will choose them over other domain registrars. Its very clear that registering a domain name with 1&1 is cheaper, this is not because they have poor services, its because they know they can charge you higher on the next year term. Unless you switch to manual renewal, they know for sure that, you will forget about the day you registered a domain with them, and before you can remember to cancel your account with them, they will have charged you already for the subsequent term. So here is the deal, if you want to quickly secure a domain for future use, then buying a domain from 1&1 can be cost effective. Better still, you can buy a domain for the first year with them and later on transfer it to another cheaper registrar. However, when you successfully transfer a domain (which should be done at least a month before expiry), you should make sure you cancel your account with them, else they will continue to bill your account even after transferring your domain. Otherwise, if you are not afraid of price, then its even better to stick with 1&1 as you can enjoy special customer offers from them. To register a domain, please click here to get started. Remember, if you are registering for the first time with them, you will get a 100% discount for the first year for a .com, the only fee you pay is ICANN fee of $0.18/yr. 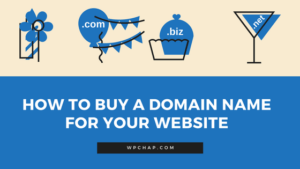 Registering a domain from 1&1 is quick and simple, the only task you have is coming up with a right name which is not taken, the rest is simple and your account is activated intantly. I have read a couple of serious complaints from other customers, but personally, I have no complain about there services whatsoever. In case I find any, I won’t even think twice to post them here. 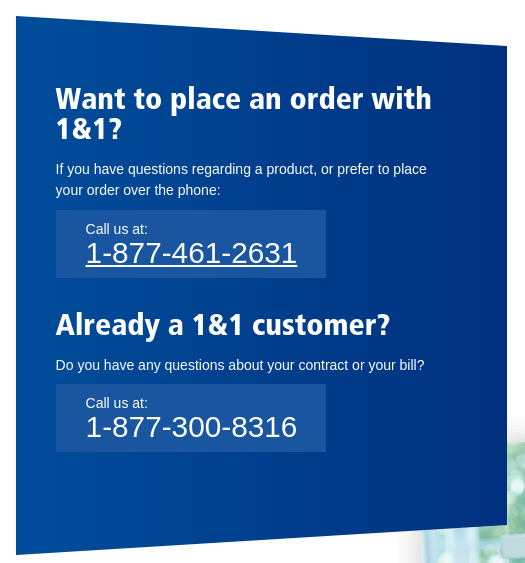 I would love to here your experience with 1&1, if you have any, please head over to the comment box below and don’t be shy to share with me and other readers. For any comments and questions, please leave them below and I will be more than glad to read and respond to you.